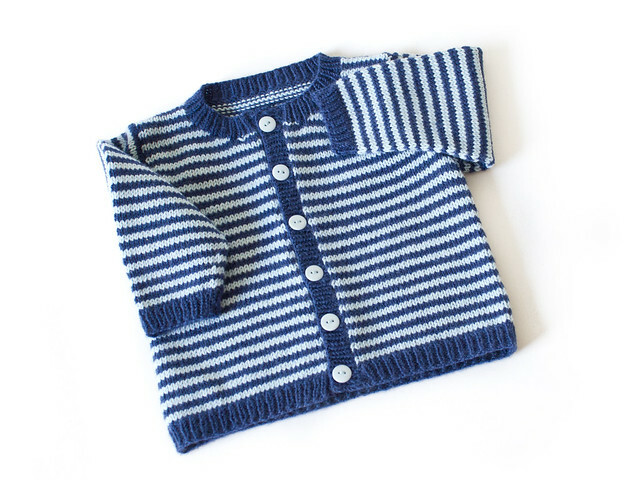 As charming as it is simple, the Striped Cardigan pattern from Debbie Bliss’s book The Ultimate Book Of Baby Knits is sure to become a little wardrobe staple for as long as baby remains small enough to enjoy its warmth and comfort. 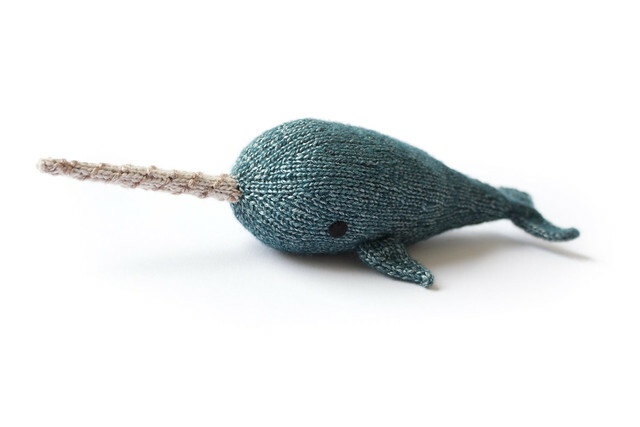 Knit in smooth Drops Baby Merino, the finished piece feels and looks smart and yet comfortable. I deviated from the pattern slightly, not in design but in technique. One thing does strike me about a number of the patterns from Debbie Bliss’s book, and that’s where there is a possibility of a seam, you are likely to find one. In larger garments a well-placed seam can give a bit of added stability and structure to a piece of knitting and can help with shape retention, but on knits so small where even a seam of a single stitch can proportionally represent so much bulk, I have been eliminating them where I have been able. In accordance with this I knit the cardigan in one piece up to the arm holes. If I had thought ahead I would have attempted to have incorporated the sleeves by setting them in with sleeve cap as I worked, but by then I would have had to have re-written the entirety of the pattern, which when I started this (quite a long time ago, knitting fact fans) was probably beyond my brain capacity. 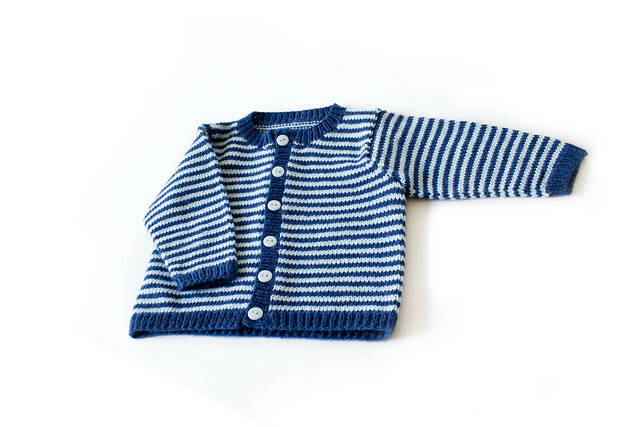 If I were to start it again now I would likely approach it differently; as you can see from the picture above, on such a delicate knit even the single stitch seam represents a fair amount of bulk (and this is on the 6-9 month size – this would appear to be even greater, proportionally, on a smaller, newborn or premature sized garment. Another area where I eliminated the seaming as given in the pattern was at the shoulders. 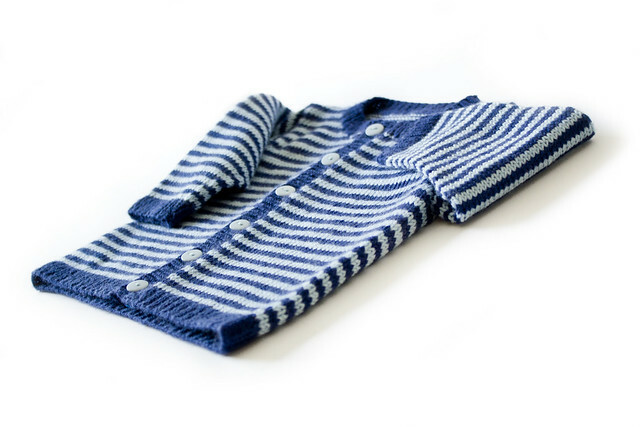 As there is no shoulder shaping involved these were simply grafted together, in keeping with the stripe sequence to give a completely smooth finish. As it will likely be a while before the Eskimini ever gets to wear this (as I am trying to spread my baby knits over a range of sizes) I think I might make a pair of bottoms out of the remaining yarn, to keep cute little baby bums warm and snug, using the colours but eliminating the stripes, so that will be the next thing on the needles! 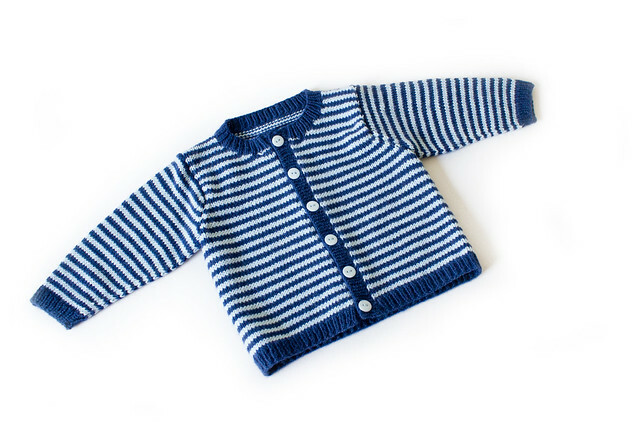 wow- you are a knitting machine – another great addition to the baby wardrobe!